Budget airline Ryanair is to cut 18 routes from its base at Barcelona Girona, following a disagreement with the Catalonian government. Ryanair said the new government, which oversees operations at Girona, had “refused to honour” a five-year extension of its agreement to base 11 aircraft at the airport rather than 6. 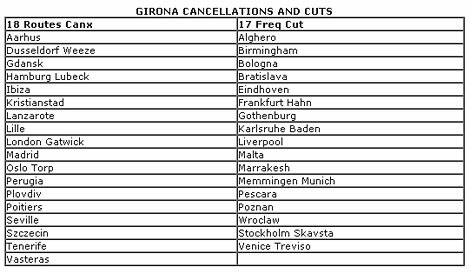 Five of the 11 aircraft will be relocated to bases elsewhere in Europe, resulting in the loss of 18 routes from Girona. These include London Gatwick, Madrid and Dusseldorf Weeze. 17 more routes will see their frequencies cut. See below for a full list of affected services. While Ryanair refers to Girona as a Barcelona airport, the city of Girona itself is some 60 miles away from the Catalan capital. Ryanair services from Barcelona’s main “El Prat” airport remain unaffected.